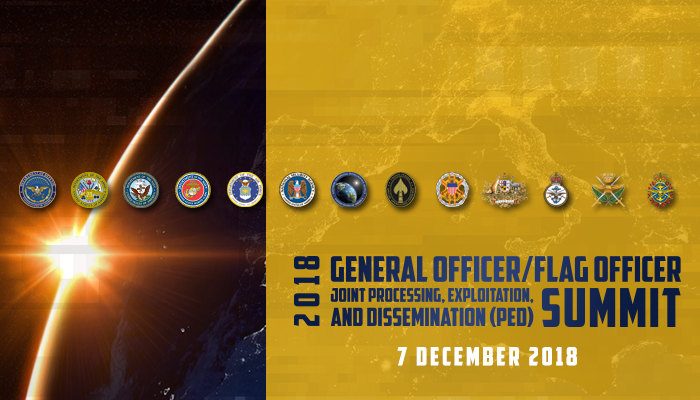 The 2018 General Officer/Flag Officer Processing, Exploitation, and Dissemination (PED) Summit is taking place on December 7, 2018. The objective of the Joint Processing Exploitation Dissemination (PED) Enterprise is to further the Joint PED Vision: any Service’s and coalition partner’s ISR sensors to be PED’ed by the best available PED node, providing the most effective support to any customer. The Joint PED Enterprise consists of a monthly 0-6 Working Groups solving challenges and issues of common concern across the Services and Combatant Commands, aiming to improve interoperability across the PED Enterprise. The General Officer/Flag Officer/SES (GO/FO) Summit brings leaders and practitioners across the PED Enterprise together to report on the O-6 working group’s actions, and present issues of concern to the PED Enterprise. The Joint PED GO/FO also provides the opportunity for Service and CCMD Intelligence Officers to network, share ideas, and discuss challenges across their respective Areas of Responsibility.